Photo cakes online Noida to create memorable experience! Now simply relish the taste and lip-smacking flavours of the photo cakes and create unique memories for the receiver. 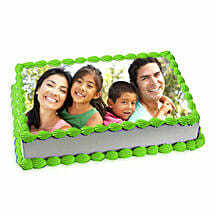 Our on-time or prompt photo cakes delivery in Noida will make the receiver jump in excitement. 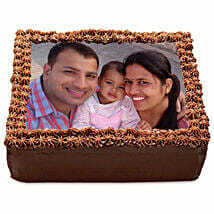 Among the gifting options, photo cakes are popular types of personalized gifts. 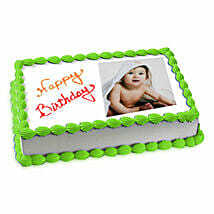 You can buy the kids photo cakes which are fun and imaginative. 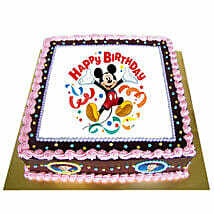 We have stocked cartoon cakes to simply cause a great stir among the children at your kid’s birthday party. For almost all the celebrations, our cakes are the show stoppers. Having the entire team of expert bakers, our online cake store takes the celebration to next level by always coming up with distinguished tastes and unique appearances. 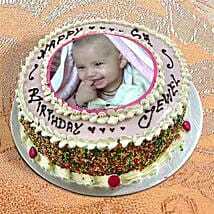 Why send photo cakes online to Noida? Photo cakes when coupled with flowers can instantly surprise the receiver. With our gift store, you can order best gifts from the comfort of your home. Place immediate orders for chocolate cakes, vanilla and strawberry cakes and enjoy the free shipping. Share special images on cherished occasions of life like Birthdays, Anniversaries, Christening and various other occasions. If you send photo cakes online to Noida, you are sure to get a ‘Thank You’ call from the loved one. We also cater midnight delivery for those who want to surprise their Valentine on 12 midnight. Our cakes are available in wide variety of flavours like butterscotch, vanilla, chocolate to delight the receiver. Why choose us to order photo cakes online to Noida? The variety of cakes we have cannot be found anywhere else. Buy 1 pound of butterscotch delight and relish the crunchy and light taste. 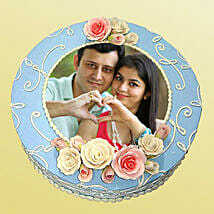 Now you can savour its flavour with the loved one by sending the photo cake. So, order photo cakes online in Noida and enjoy the personalized and classic version of the black forest, black current, red velvet cake. Order cakes online from us and get exclusive discounts on every purchase. To surprise the special someone, you can also buy the designer cake and enjoy delivery in few hours.